My sister and I got my Mum Nigella's latest book for Christmas. If I'm being entirely honest, I think we've used it more than she has so far! 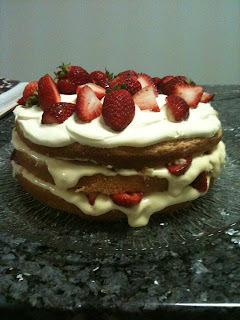 I just love what Nigella does... everything she makes looks incredible and this was one I couldn't flip past. It was surprisingly easy to make. I must admit, I did get a little freaked out by the photos and Nigella's comment that it didn't matter if you couldn't slice it perfectly in three - it would taste just as good if it was falling apart - I can't work like that! The cake was absolutely delicious! It disappeared very quickly and was just the cake I needed... I happened to be going through a fairly difficult time when I made it. The only thing I would do differently next time is to use plain thickened cream (still beaten though of course) on the top instead of double cream. I found that after it had been in the fridge for a little while the double cream went a bit hard and wasn't that pleasant to eat - a shame on day two when the rest of the cake tastes even better with the strawberry flavour having gone right through! I'm going back to put this one up - these are just photos I took on my phone because I was so impressed with the end result - but in the future I'll be sure to take photos of the steps as well. (You can do this in advance, even the day before. It needs to be completely cold before you use it). Preheat the oven to 180c and prepare your tin (a springform tin, just line the bottom and grease the sides). In an electric mixer, whisk 3 eggs and 250g caster sugar until 'pale, moussy and more than doubled in volume' (I found it took about 10 minutes). Turn the mixer down and gently add 90ml of hot water. Slowly whisk in 1 1/2 tsps baking powder and 150g plain flour - you might need to stop the mixer a couple of times to scrape down the sides and there shouldn't be any lumps in the mixture. Pour it all into the tin and pop it into the oven for about 30 minutes (you'll know when it's done!) Take it out of the oven, leave it to cool in the tin for 5-10 minutes and then carefully take the outside of the tin off. Then let it rest and cool before moving onto the next (and most fun part!) - the assembly. Tah dah! 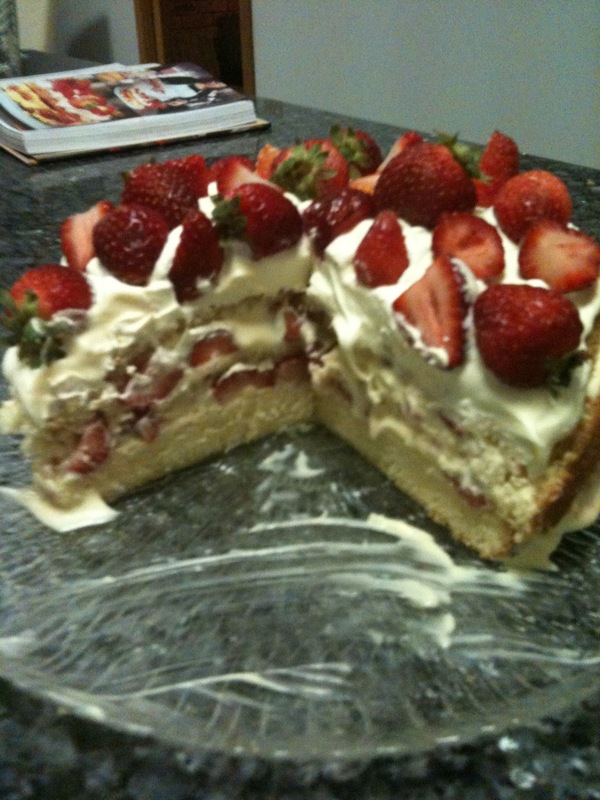 Looks pretty impressive and tastes even better! Inside of the cake - yum!